What I’ve Got in the Pantry Enchiladas. You may ask: is this meal healthy, even in a relative sense? You might ask: is this actual cooking, or did you just throw everything in your pantry together and call it a meal? In fact, you could ask lots of things. Inspired by my very first cookbook…wait for it…the Complete Idiot’s Guide to 20 Minute Meals. That bad boy has been around so long it’s missing pages and a spine. But it was a backbone to my college experience, and I’m never getting rid of it. optional/topping: limes, cilantro, green onion, sour cream, hot sauce, more cheese, etc. Preheat oven to 400 degrees F. In an oven safe pan, thoroughly mix together the corn, black beans, cream cheese and shredded cheese, spices, and about 2/3 of the jar of salsa. Bake for about 10 minutes. In a saute pan, heat some olive oil. Cook the onion and peppers down, about 5-7 minutes, and season with a little bit of salt and pepper. Pull the corn mixture from the oven and spread a bit down the middle of a tortilla. Top with a bit of onions/peppers, then roll it up and put in another oven safe pan. Repeat, placing the enchiladas in neat, tight little rolls, until the filling is all used up. Or, use the rest of it to make nachos! 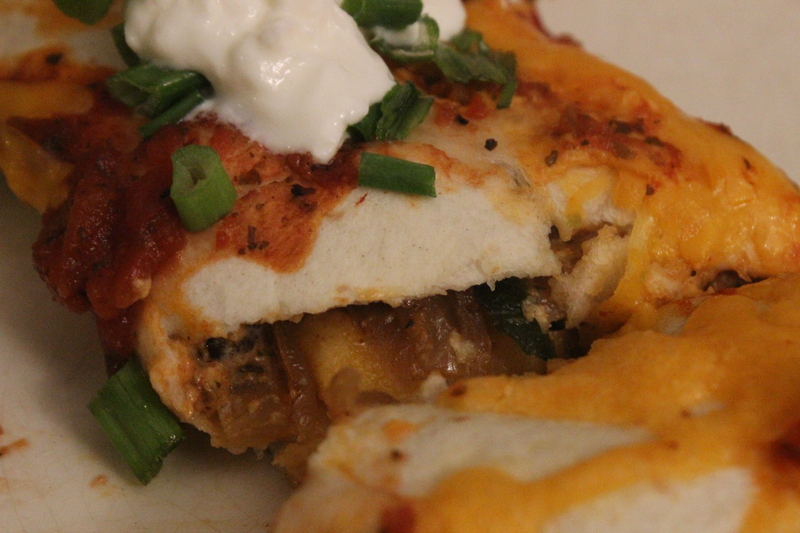 Top with a little bit of cheese and salsa and put back in the oven for another 10 minutes. Serve with your choice of accoutrement – a squeeze of lime juice as they come out of the oven, a little bit of sour cream, anything your decadent little heart desires. No one is winning any Michelin stars for this meal. BUT this requires very little effort on your part, makes tons of leftovers, and can be tweaked in about 1001 ways to suit what you have in your pantry, so you, too, can eat un-healthfully and without guilt. It’s pretttttttty tasty, to boot. 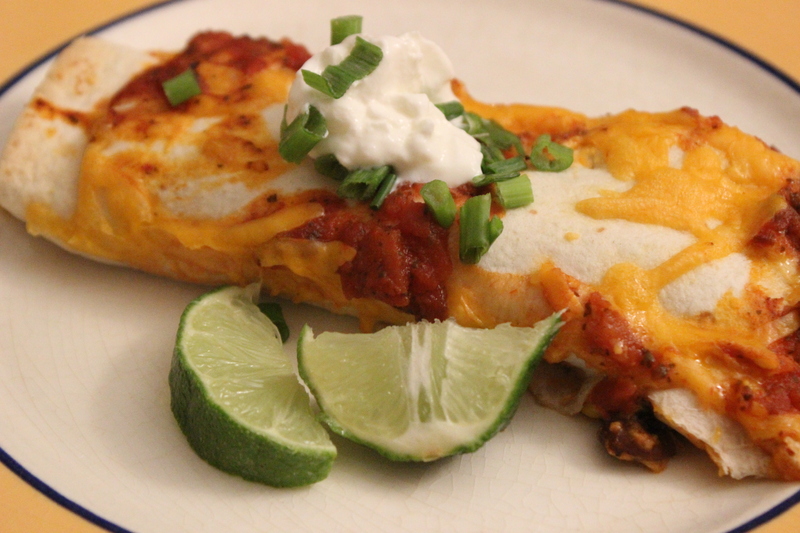 Posted on February 19, 2015 February 18, 2015 Author varinajCategories vegetarianTags black beans, cheddar, corn, cream cheese, lime, mexican, onion, poblano, tortillas6 Comments on What I’ve Got in the Pantry Enchiladas. Heat the olive oil in a large skillet over medium heat. Add the minced garlic, the crushed red peppers (if you’re using them). Also add your other “heat” factors – jalapenos, chilis, poblano pepper. Stir in quinoa, broth, beans, tomatoes, corn, chili powder, cumin, salt and pepper. 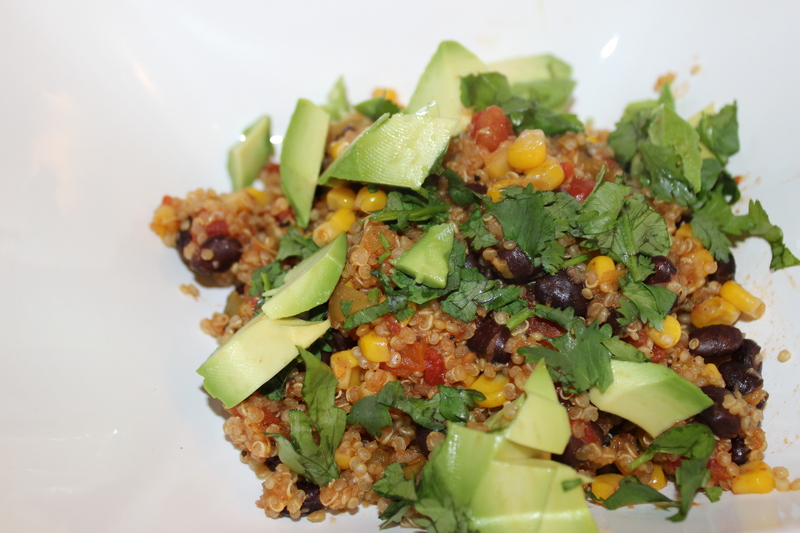 Bring to a boil and then reduce heat, cover and simmer about 20-25 minutes, or until the quinoa is cooked through. Remove from heat, stir in lime juice, and serve with your choice of toppings. This was good, if not knock-your-socks-off. Fresh ingredients – fresh jalapenos, fresh corn, fresh tomatoes – would really bring this up a notch. And I’m not sure how I didn’t notice the lack of onion in the ingredient list – I’ve never met a recipe to which the addition of onion didn’t make it better! Overall, though, this was quick and easy, a good way to use up the leftover ginger and cilantro sour cream mix from the other night, and it provided us with some great leftovers for lunch. I might try this again in the future with more of a Mediterranean twist – I’m picturing garbanzo beans, sundried tomatoes, onions, garlic, tahini – tossed with fresh parsley and cucumbers? Maybe the next time we need to clean out the pantry. This was a big weekend. Between a Friday night out at an improv show, all-you-can-eat barbecue, trapeze lessons (! ), the Diwali fest last night, and a 5k today, the Husband and I had a gorgeous, but incredibly busy weekend. And this coming Saturday, we set off on our biggest adventure yet – our honeymoon! Two weeks away from home, though, means we should be cooking and eating as many home-cooked and light meals as possible – both to go a little easier on the wallet and a little easier on the waistline. That first part means relying on what we have already in the pantry – and the second, a lot of vegetables. So tonight, I turned to a meal that even the Husband, a non-vegetarian, can get into. This recipe, like so many, is largely based on a Cooking Light recipe. Heat a large skillet over medium heat, and add about a tablespoon of butter. Add the onions, cook them down a bit, and then add the garlic, stirring occasionally. Cook for 4-5 minutes. Stir in cumin, a little bit of salt, coriander, red pepper, and a dash of black pepper, cook for about 1 minutes and then remove from heat. Add the panko and the lime juice; stir it all together. Put the beans in a food processor and pulse until they form a chunky paste (Cooking Light instructs you to mash the beans in a bowl with a fork; I find this take too long and that the beans never get to the right consistency). Add the beans, eggs and panko/onion mixture. After mixing it all together, form 4 patties (they’ll look like little burgers). Add some butter and olive oil to the same pan as before; heat over medium. Add the patties and cook on each side about 4 or so minutes on each side; keep the cover on in the meantime. A note or two: You want the patties to be browned – but be careful, they sometimes burn! Just add a little more olive oil or butter if they do. The patties also have a tendency to fall apart a big – no worries, just squish them back together. In a separate bowl, combine the sour cream, a tiny amount of salt, some pepper, chopped cilantro and the grated ginger. Add a squeeze of lime juice and mix well. 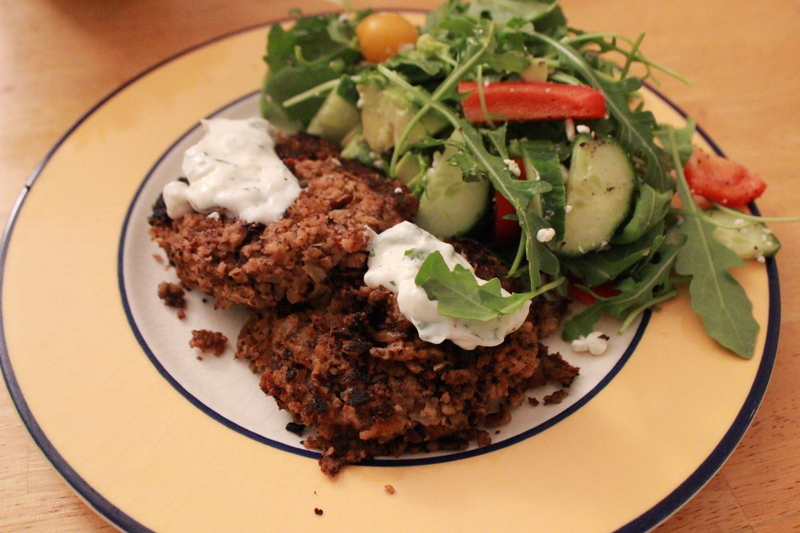 Serve the patties with a side salad and the cream mixture. I’ve made these once before, and the Husband and I were both surprised at how much we liked these. We had the same reaction tonight. They’re hearty, filling (probably because we eat twice the portion size Cooking Light recommends! ), and (I think) healthy. You do have to watch the burn factor on the cakes, and go easy on the salt in the sour cream mixture.